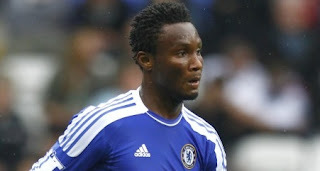 Nigerian midfielder Mikel John Obi will be looking to bounce back with Chelsea in the Premier League today as they look forward to overcome fourth bottom Wolves at Stamford Bridge. Chelsea manager Andre Villas-Boas will be rallying his players to recover from the woeful outing to put the Blues on the title track again. With Michael Essien still recovering from knee surgery, Mikel is likely to maintain his place in the starting line-up. Level on 22 points in fifth with Liverpool and Arsenal, Chelsea need all three points against Wolves if they are to keep pace with Newcastle United and Tottenham Hotspur who are three points ahead with Spurs having played a game less.